The new Rod Pod by K&E Stopper lures is going to be a game changer for all you ice anglers who get frustrated with tangled lines and busted rod tips. 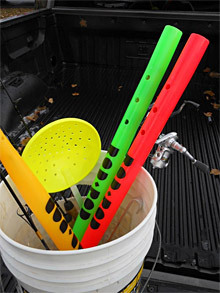 The Rod Pod is a hard-plastic rod sleeve for rods up to 30 inches. Gone are the days of spending precious time digging hooks out of vinyl rod socks. 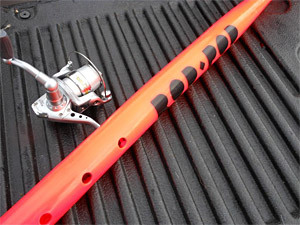 The Rod Pod completely encases the rod blank, which means your line, hooks, eyes, and rod tips are secure and protected. Throw your rods in the bottom of your sled, or pile them into a 5-gallon bucket without worrying about tangled lines and broken tips. The Rod Pod brings a new meaning the word efficiency when it comes to quickly deploying fishing rods. 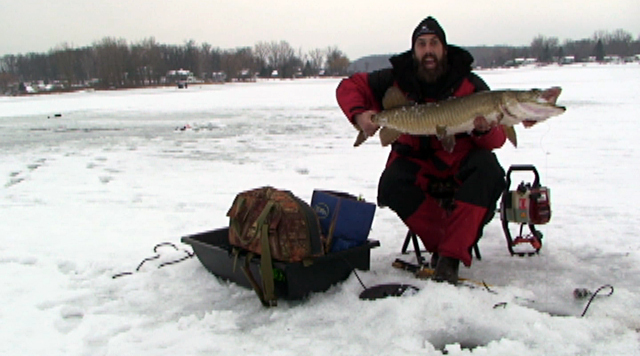 Being more efficient on the ice will lead to more fish day in and day out. One of my favorite ways to increase on-the-ice efficiency with the Rod Pod is to store my go-to rods upside down in a 5-gallon bucket. This allows me to quickly deploy them without the headache of intertwined lines, bails, and reel handles. This also allows me to pack more rods into a single bucket, saving space for hauling more gear. Lastly, the Rod Pod has strategically-placed holes drilled into the back of it. This allows you to hang your rods on the wall of your permanent shack or in the garage for summer storage. As they say, anything that lays on the floor gets broken. Get your rods off the floor and hang them up with the K&E Rod Pod. The overall simplistic and durable design of the Rod Pod is going to help protect your valuable ice gear and make you more efficient this hardwater season. About the Author: Ice fishing tips, techniques, tactics and ice fishing tackle and gear product information from various K & E Tackle Stopper Lures Team Stopper Pro Staff members. K & E Stopper Lures produces the best assortment of ice fishing tackle and gear you know on the market. You can find their products lines such as Best, Arnold, Bear Creek, Moon Jigs, Dot, Carlisle, Sitka, Skandia, Whip'R and more at your nearest sporting goods store, or online at AnglersMart.com.